You would have a hard time convincing me to spend my free time wandering through stores most of the year, but at Christmas time, I find it becomes a little more fun. I enjoy spending some time in decorated spaces, listening to recordings of Christmas carols, and in the midst of crowds of shoppers out to pick out the perfect presents for everyone on their list. I do most of my actual Christmas shopping online, because it is just so much easier and more enjoyable to actually –shop- in the calm environment of my home, sitting by our Christmas tree. 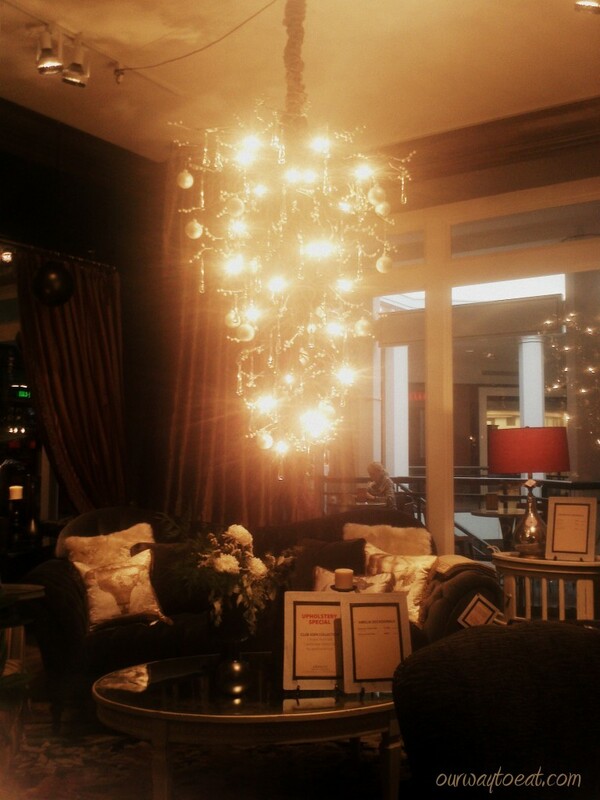 Decking the halls is an important part of most people’s Christmas traditions so I wanted to share a peek at a recent excursion I made to Arhaus, a furniture and home design store that is a new arrival to the Galleria in Edina, Minnesota. 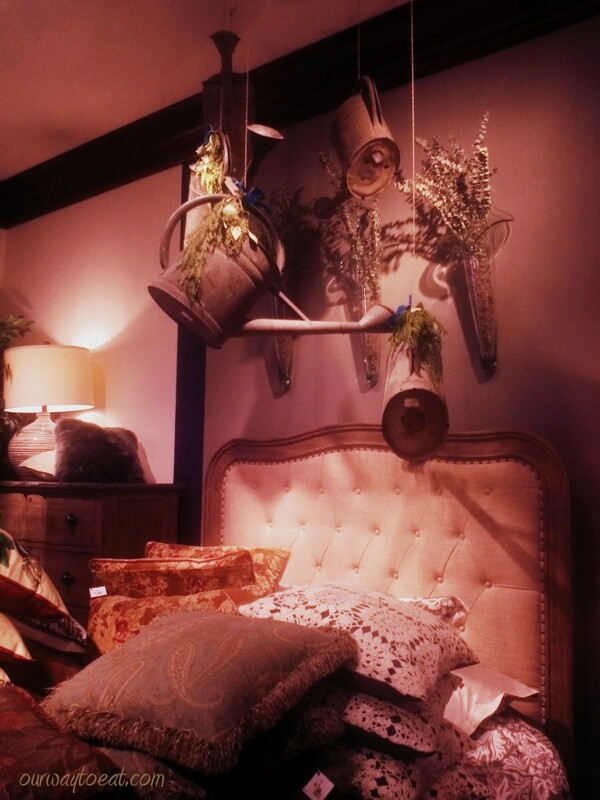 I recently discovered that Arhaus which has other locations around the country is full of inspiration for home decorating ideas, for the holidays, or any time of year. 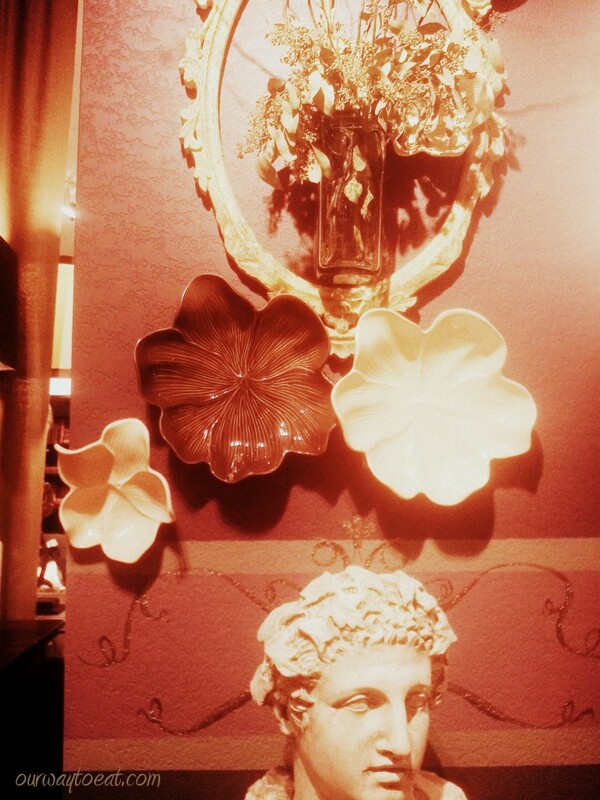 There are vignettes throughout store, such as this interesting juxtaposition– a Greek or Roman bust, an ornate frame, a vase of dried greenery and flower-shaped plates mounted on a faux-painted wall. Not everyone would want to recreate this display in their home, but it certainly gives ideas that grouping seemingly random items together can be an interesting way to display statement pieces along with items that might be hiding in the cupboard. An ornament-adorned chandelier above the dining table topped with moss-lined bowls filled with silver pinecones and golden pears makes a stunning holiday tablescape and is an accessible idea that anyone could recreate at home. Employees are quick to explain that Arhaus employs shoppers throughout the world who acquire their one-of-a-kind, reclaimed items that are sold alongside their new, custom furniture and decor. 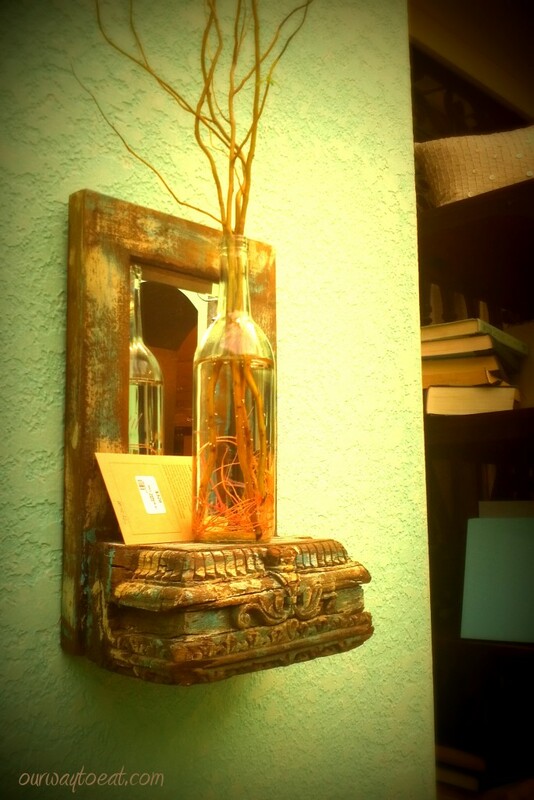 A piece of time-worn ornate Victorian trim makes an eye-catching shelf below a barnboard-framed mirror. 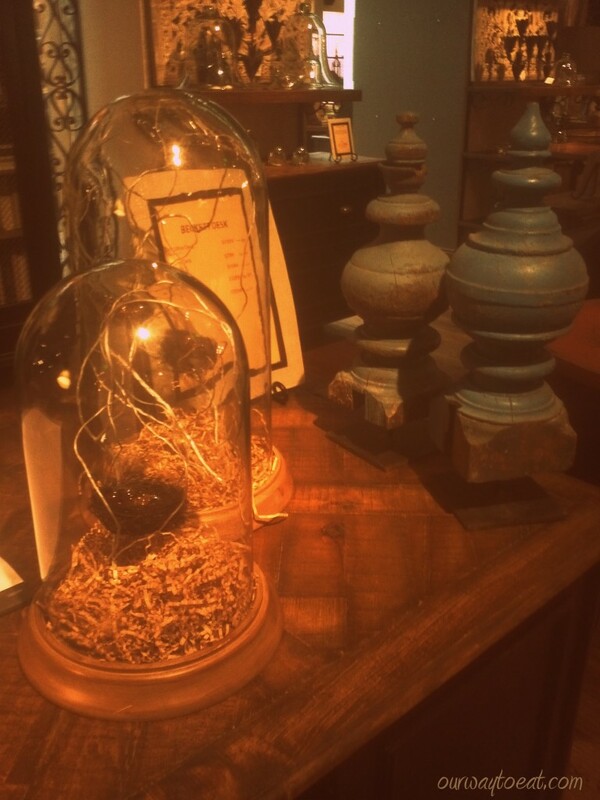 I love the simple bottle of rooted twigs sitting on the shelf. I have a bottle just like this, and I have twigs, but encouraging twigs to root in a bottle is a fascinating decorative touch that had not occurred to me. 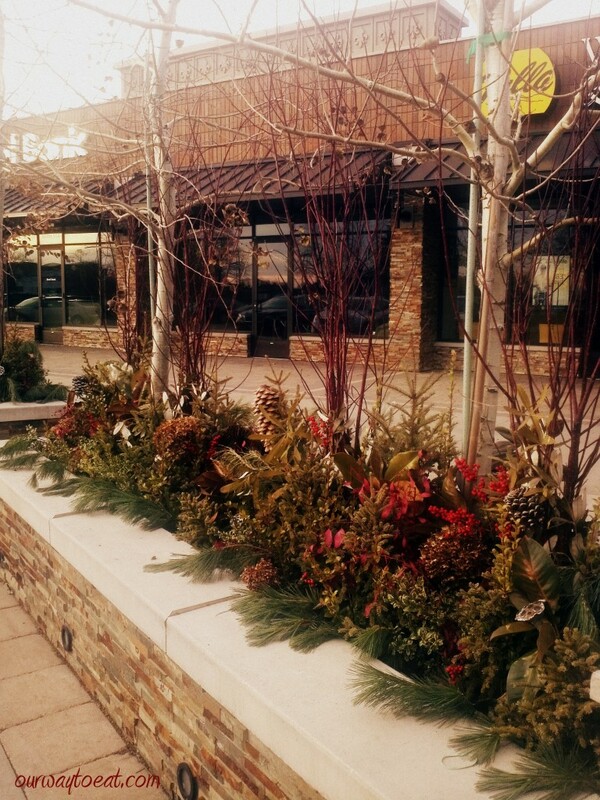 Speaking of twigs, the planters outside the Galleria were done up with seasonal greenery, dried hydrangea, birch, huge pinecones and red twigs and are surprisingly similar to the planters outside my front door. The only difference from my display is that my spruce branches, birch logs, dried stonecrop and red twigs were all scavenged from nature and saved when necessary garden and tree-pruning took place earlier in the fall. The first time I saw a Christmas tree hanging upside-down from the ceiling, it bugged me, because–that is just not how Christmas trees are done–. This manner of displaying a tree has grown on me. This upside down ornament-adorned tree was grand and really lit up the room with Christmas splendor. Another unexpected display were these aluminum watering cans hanging from the ceiling in an irreverent display above a bed. This isn’t going to work in everyone’s bedroom, but it could perhaps work in a sun porch or a mudroom, or outdoors outside of potting shed? Everyone and their brother are making little winter scenes with tiny trees and animals nestled knee-deep in “snow,” which is sugar or fine sand in the bottom of vases, and in lids of upside down jars this year. I think it is cute, cozy, homespun, vintage Christmas touch. I won’t deny that I picked up a few, very reasonably priced little trees at Menards to make a winter display myself. Aren’t we all trying to channel Christmas at Grandma’s house, into our homes around the holidays? 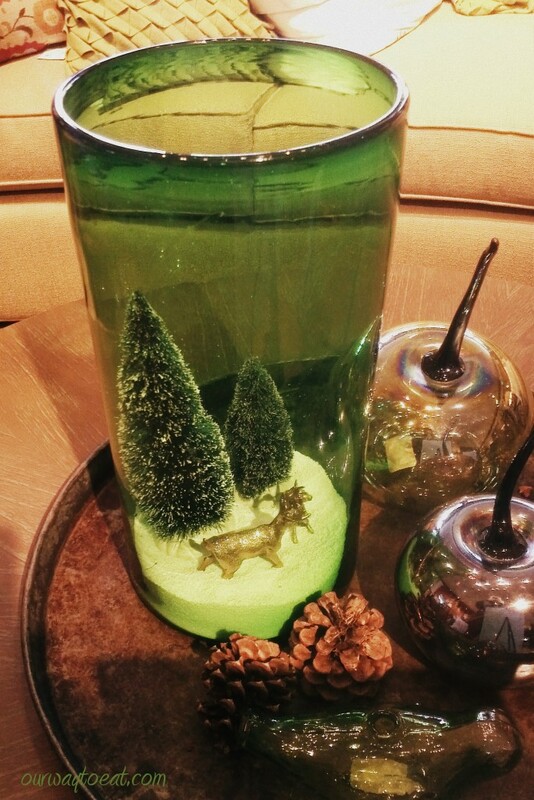 This tray topped with a green hurricane vase with a winter scene, pinecones, a glass bird and a grouping of other sparkling ornaments is another accessible Christmas design-idea that a trip through Arhaus afforded me. 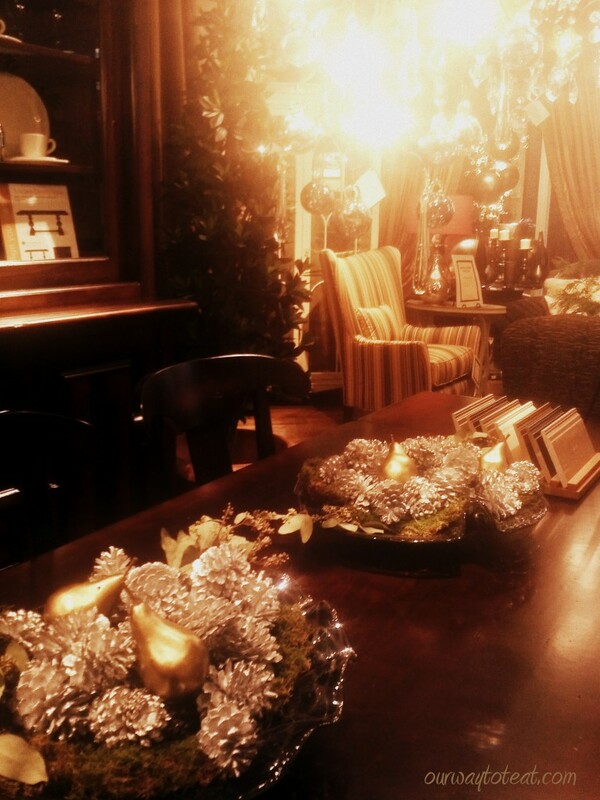 Arhaus is a fun place to visit for fascinating home-design ideas for decorating at Christmas and throughout the year, and is worth the trip whether you want to shop or just browse. What are your favorite sources of inspiration for home decor ideas?